This Sterling Silver 7mm Milgrain Wedding Band, literally translated to mean a thousand grains, holds a spectacular design that is unlike other wedding bands. It is traditional yet refined, drawing on inspiration from a centuries-old technique to create a decorative design in the precious metal. 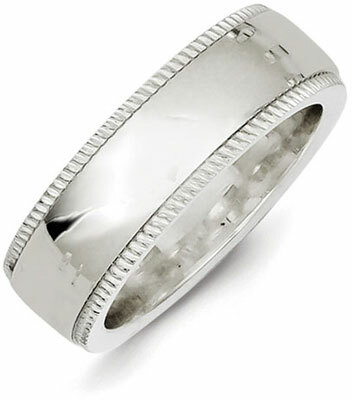 At 7mm wide, this wedding band is a perfect size to announce the vows you have entered into with your soul mate. It is carefully designed as a comfort fit band, which you can see from the rounded-edge treatment on the sides of the ring. The surface edge of the ring is ornamented with a design reminiscent of tiny grains of sand to symbolize how life is made up of countless moments to be remembered and cherished forever. The ring is composed of the finest sterling silver (.925) and buffed to a high polish to bring out its lovely silver color and reflective surface.